Are you ready to upgrade your ipod? Here's a great opportunity for you! JustDeals.com has an excellent ipod buy back program and your ipod doesn't even have to work! 1. Fill out their online form and give them the model and condition of the ipod. This will determine the estimate of what you will get for your ipod. 2. Become a member of their buy back program. 3. Print out their shipping label. You even get FREE shipping! 4. Within 7 days, you should receive a refund in your paypal account. 5. You can either withdraw the money to your bank account or apply it towards the purchase of another item on their site. HURRY! 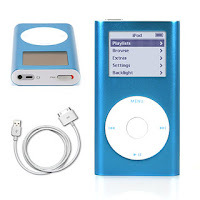 THE Apple iPod Mini 4GB MP3 4 GB Player M9802LL/A BLUE PICTURED ABOVE is currently available for $54.95 while supplies last. Just click on the box below to go directly to the site. If you decide to make a purchase, here is a coupon code for added savings!